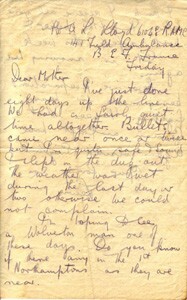 Letter from Lewis Lloyd to his Mother dated Friday. He has just done eight days up the line and bullets came near but he is fine. He slept in the dug out. He asks if there are any Wolverton men in the 1st Northamptons as they are near. He says he receives all her post and the paper and book arrived safely. It is snowing. He mentions preparations are being made for heavy fighting and he noticed that German aircraft have been visiting England. 1 page.